PVC boxes with super clarity. 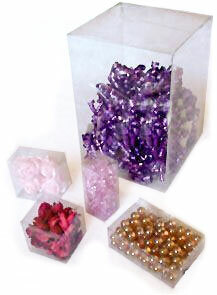 Great for gift packaging and all kinds of retail products. These are tuck top and bottom boxes. They can be flipped open from both top and from bottom. It comes flat and can be easily assembled before use. Improving your products attractiveness by using these PVC boxes.